Funny how electronics of the 70s were better dressed than the people who used them, no? Mixed-media artist David "Netherland" van Alphen tackles the decade's blighted fashions and obsession with sound in a new show at San Francisco's Gallery 1988. 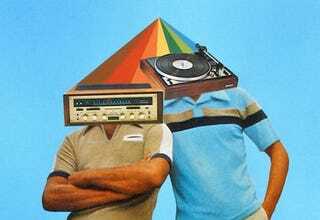 Netherland's showing, entitled "Raised on Hi-Fi," is visually rich, highlighting the mixed bag of 70s visuals with a series of grotesque human/Hi-Fi equipment hybrid beings, each melded with colorful retro kitsch.